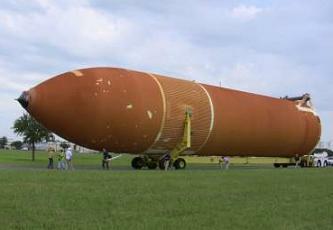 NASA and Lockheed Martin managers at the Michoud Assembly Facility (MAF) have spoken pride in the manufacturing, assembly, and repair work on External Tank 122 (ET-122), which was damaged by Hurricane Katrina five years ago. On Monday morning, the tank was rolled from Building 420 to the Pegasus barge that will carry it to Kennedy Space Center over the next week. The tank is tentatively assigned to fly on STS-134 in February, but a final decision on which tank will fly that mission – ET-138 or ET-122 – will be made between now and November. As noted in the Program Requirements Control Board (PRCB) presentation on the tank allocation debate, there are some slight differences between ET-138 and ET-122 – visible by a large number of repair patches on the latter, but also by way of safety modifications. “Both ET-122 and ET-138 are very much fit to fly,” said Pat Whipps, NASA resident manager at Michoud and ET deputy project manager to NASASpaceflight.com report Philip Sloss. “ET-122 represents a couple of design modifications less than ET-138, primarily because it was originally an older tank. “When we were given the go-ahead from a program standpoint to get it fit to fly as a launch-on-need for potentially the very last Shuttle mission, the timeframe didn’t allow us to incorporate all the new design return-to-flight modifications; however, the configuration that ET-122 represents is one we’ve already flown several times. Thanks to a continuous process of mitigating the loss of Thermal Protection System (TPS) foam, those main differences relate to areas such as the Ice Frost Ramps (IFRs), previously an area of interest for small sections of foam liberating during ascent. “The ice-frost ramps on ET-138 are a little different design than those on ET-122, which were already applied at the time of its original build,” added Whipps. “Secondly, the yokes that are primarily made out of titanium today were made out of aluminum prior, and so the potential might be a little bit more ice might accumulate on those yokes that hold the LOX tank feedline that runs down the side of the tank. 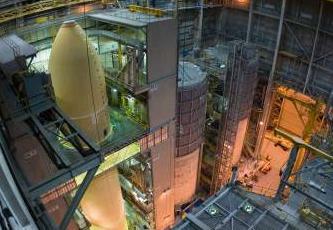 At the time Katrina rampaged over the region, the tank was in Cell-A of MAF’s Vehicle Assembly Building (VAB), where it was already undergoing return-to-flight modification work. “It was in Cell A for those mods – we had taken off the old bipod ramps, we had started removing some of the PAL ramps, and various other little mods were in work,” added Lockheed Martin’s John DesForges, ET-122 project manager (also known as the tank’s “missile mother”). 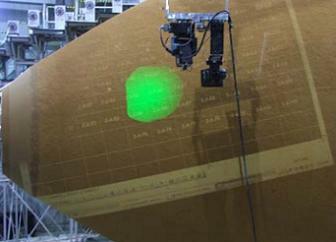 After the hurricane passed, NASA and Lockheed Martin made initial assessments of the tank. Their early conclusions were dire, as extensive damage was observed on and around the hardware. Following the inspections to assess the hurricane damage and to determine whether the tank could be flown, DesForges was made project manager and tasked with setting up a feasibility study on repairing the tank. “My first duty, about three weeks after the hurricane, was to climb the stairs in the VAB to inspect the damage and from that point on I’ve been associated with it,” DesForges said. “I did the damage assessment, where we inspected the tank, documented all the damage, put together a repair plan, and presented that to the customer. We gave them a couple of options about how to proceed. “We did a whole series of NDE (Non-Destructive Evaluations] – X-ray, ultrasonic inspection, penetrant inspection – and the tank was fine, not even a contour was changed. Most of the foam damage was limited to the LOX (tank) and the intertank; back at the aft end, where the two umbilicals are located. After the inspections and assessments, it was decided that ET-122 would be put at the end of the tank production line to minimize the impact that the unique inspections and repairs would have on the overall tank production schedule. “We put this tank at the end, not necessarily because it was the worst tank to fix, but because it would have impeded our ability to get all of those other tanks through on-time,” Whipps added. “It made more sense to take our time, do all these inspections and repair plans, and put it at the end of the production build for all External Tanks than to interrupt – the tanks that were already in flow. 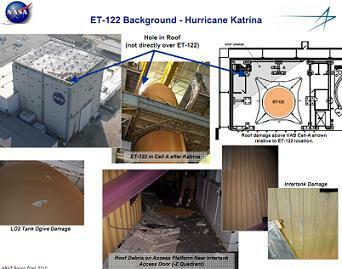 In November, 2008, NASA officially directed MAF to fully restore ET-122 for flight. In addition to all the required return-to-flight modifications, all the repairs to the tank were completed – visible as white areas on the tank. 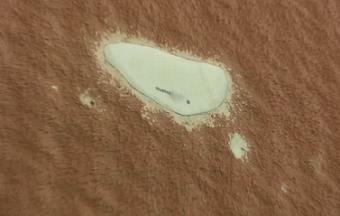 “Everywhere you see a white spot is where we had to repair foam damage,” DesForges noted. “There’s three large areas on the tank where we actually went down to the metal and inspected the metal to make sure that it was OK, and sure enough they were. “On the LOX tank and intertank, which is where most of the damage was, we combined a lot of the small locations into a larger location, simply because it was easier to repair. “There was quite a large area on the bottom of the intertank, near the intertank access door, where we just stripped the intertank – the full length of it, about twenty-two feet – and resprayed that entire area. Whipps said that the repair work on ET-122 was scheduled around production of other tanks, as MAF’s priority was focused on supplying the line of tanks that aided the impressive flight rate between late 2008 and early 2010. 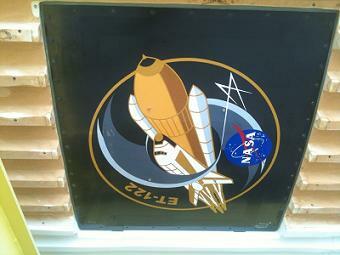 Along with the repair areas, the tank also incorporates a logo on the intertank access door to commemorate the tank’s history designed by Jon Irving with Lockheed Martin. The tank’s history can also be noted via some of its own hardware, with the acreage sprays approximately ten years old. 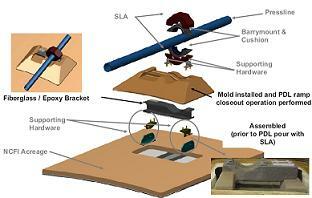 Additional testing and analysis was carried out to validate that wasn’t an issue. “There has always been the concern that we be sure that we have enveloped the potential flight range of the tank with data, so that we can be sure that it is fit to fly,” Whipps said. “We needed to do some more testing on aged samples that would be similar or older than the foam that ET-122 represents. “We now have that data completed and it shows that there’s been no degradation related to the little older foam on this tank than what we’ve flown before. So this does represent a new I’ll call it ‘fleet leader’ for the age of the foam, but the data shows that were within all the expected mechanical properties. Several hundred megabytes of high quality video and images from ET-122’s rollout are available on L2.